I love Echols’ Young Adult novels. Each time I read one, I fall a little bit more in love. So when I got the chance to read one of her Adult novels, I was excited. For the majority of the novel, I felt it was fantastic. The people have dimension and the plot line is interesting. I could see where things were headed, but I still wanted to read more. The last few chapters were a little heavy on the drama for my tastes, but I still enjoyed the novel as a whole. Sarah has just returned from South America where she tackled a crazed rock star problem for the PR firm she works for. Despite her success in securing an album from Nine Lives, he still ended up in jail, leaving Sarah’s job with the agency in question. With her future on the line, she is given the task of keeping The Cheatin’ Hearts, a country band, from breaking up. They must deliver a new record in a week and perform at a 4th of July nationally televised concert. Sarah goes in prepared, but ends up having to change her game at every turn. The characters that make up the band are interesting and easily held their own. Erin, the female of the group, has a lot more beneath the surface. She puts on a Daisy Duke southern chick act, but it is easy to see that she’s not completely that person. That might be a piece of her, but there’s a lot more to her. Owen, the drummer, has the reputation of being the sweet, albeit slightly slower, member of the group. But like Erin, it’s an act the public buys and wants more of. Martin is the musical genius that isn’t as put together as well as everyone thinks. And Quentin is the leader, the one that makes the pop hits and big decisions for the group even while acting like an uneducated hick. They all bring so much to the story that I could easily read a book about each of them. The romance part of the novel wasn’t exactly my cup of tea, in that it moved extremely fast and while it was easy to get caught up in it, it was also easy to remember that this novel takes place in about the span of two weeks. I felt like I could go along with it up until the end of the novel, when I kind of wanted to hit the brakes hard. Overall, Echols has a good Adult novel. 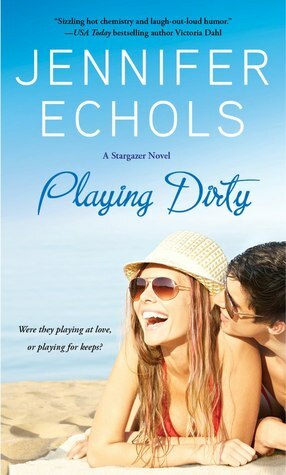 I’m still loving her YA novels more, but the balance between characters and drama in Playing Dirty was good. Once I was sucked into the novel it took a lot to pull me back out and that’s enough for me to still be interested in reading whatever Echols publishes. Thank you to NetGalley and Pocket Books for an advanced copy of the novel in exchange for an honest review. This entry was posted in Contemporary and tagged Contemporary, Jennifer Echols.